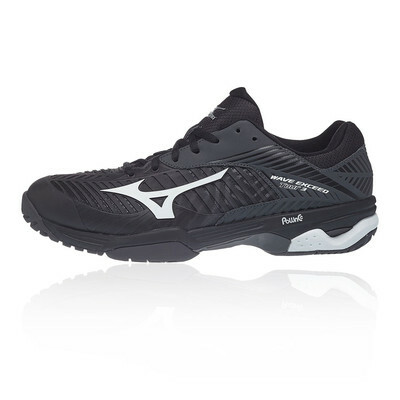 Designed for a cushioned feel with speed and structure, this shoe is anatomically engineered with the signature Mizuno Wave technology to protect the ankle, while the D-flex groove and the SR-touch enable quick movements and explosive acceleration. "Bought these for my son and he says they give good court grip (outdoor hard court) and are very comfortable - will have to wait and see how well they last." The Wave Exceed Tour 3 All Court Tennis Shoes are constructed with a unique 3D-Solid upper which provides the highest level of softness and durability while maintaining superb breathability. This allows a constant supply of fresh, cool air, while overlays provide superb structural integrity throughout. The overlays not only offers excellent durability but that work in tandem with the traditional lacing system to get a perfect, snug fit keeping you concentrated on the game and less distracted. Lastly, A high-grade removable insock is also included in this shoe's midsole to offer extra cushioning and comfort which some of us may require for those longer game days. An exceedingly lightweight material is used in the midsole of the Exceed Tour 3 known as PoWnCe which offers excellent comfort and resilience properties. Another lightweight midsole material used is the Sr-Touch which absorbs shocks and keeps the transition smooth and fast due to its quick rebound properties. Midsole technologies work together to absorb the shock and impact forces that occur during the heel strike phase of the gait cycle. The midsole harnesses the energy created during that phase and transfers it to the forefoot area where that same energy is used to push you off into your next step. 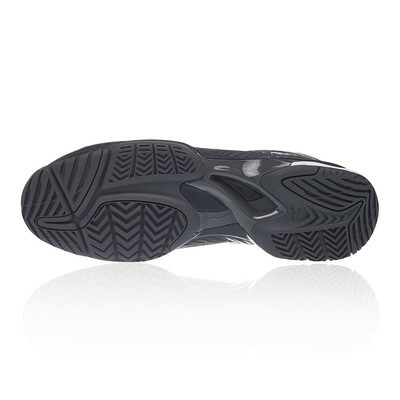 In addition, the Mizuno wave resides in the midsole. The wave technology uniformly disperses shock throughout the sole, providing excellent cushioning and enhanced stability. An extremely durable carbon rubber known as X10 is used on the outsole which allows for longer wear in high impact areas and provides more traction during heel strike. Specifically engineered diagonal grooves known as D-Flex Grooves have been built into the midfoot area of the shoe to allow the player to turn at maximum speed and power by efficiently transferring natural body movement and change in direction. 3D-Solid - A unique upper providing the highest level of softness and durability, while maintaining breathability.